Condensation is the most common variable in liquid level applications, and it degrades the mea- surement reliability of typical ultrasonic sensors. 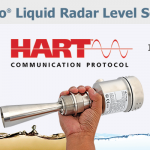 For this reason, users often pay more for radar sensors to address condensation. Until now. 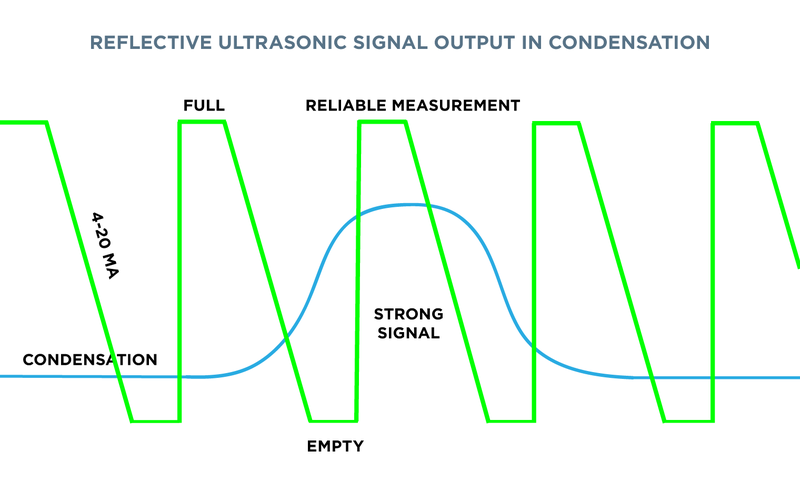 How does condensation affect the function of typical ultrasonic sensors? 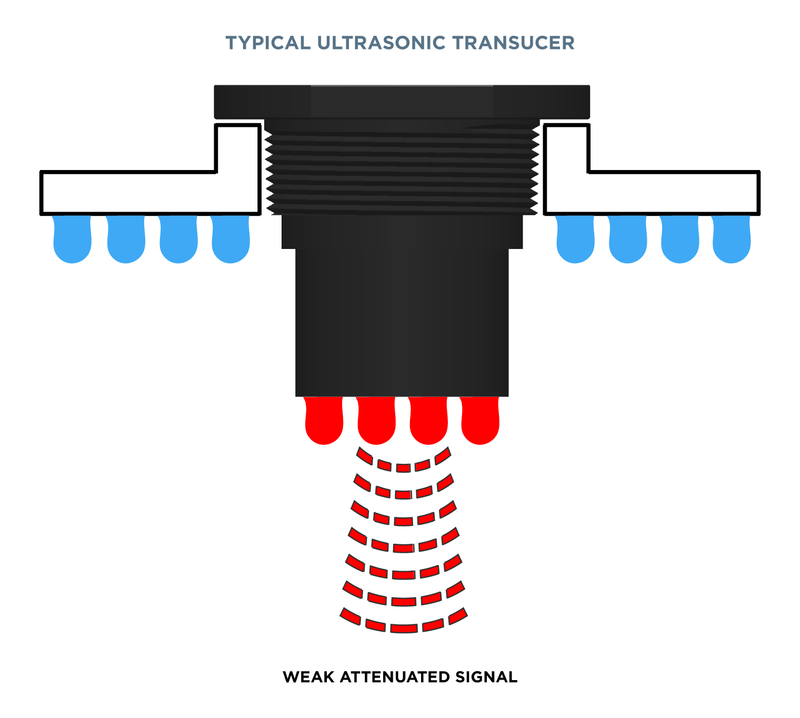 When droplets form on a typical horizontal ultrasonic transducer, they attenuate the acoustic signal, and weaken its strength by 50% or more. 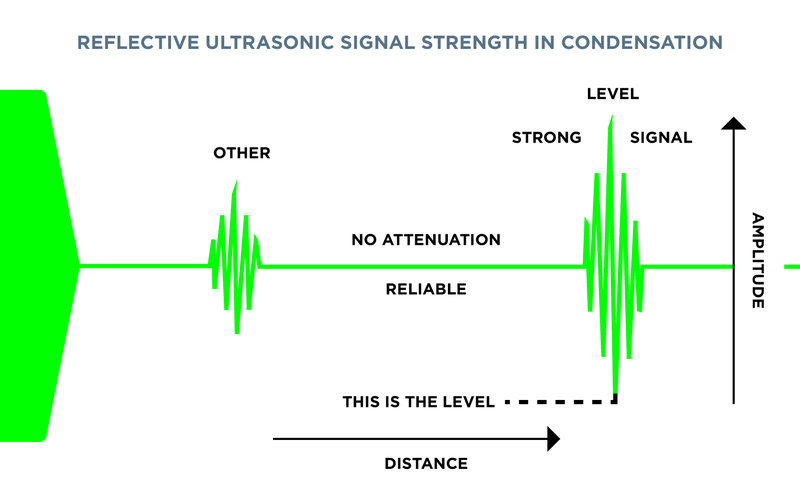 How do weak acoustic signals affect the reliability of typical ultrasonic sensors? 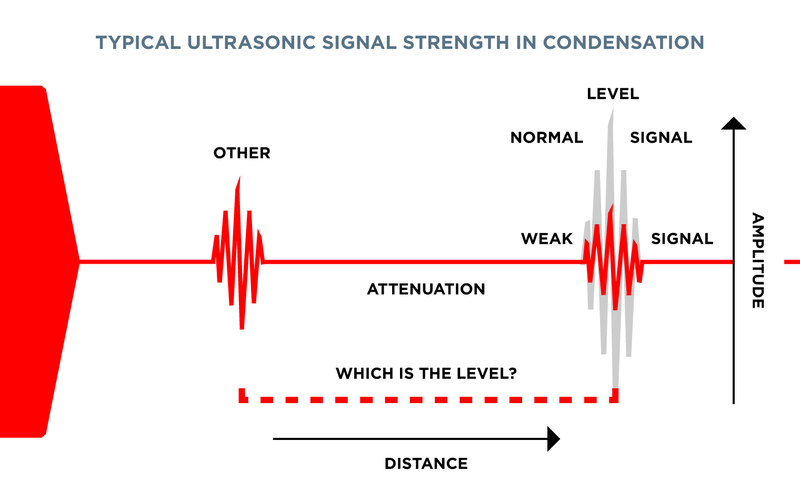 As condensation builds and acoustic signals weaken, typical ultrasonic sensors have difficulty differentiating weak level signals from other stronger signals within the application. 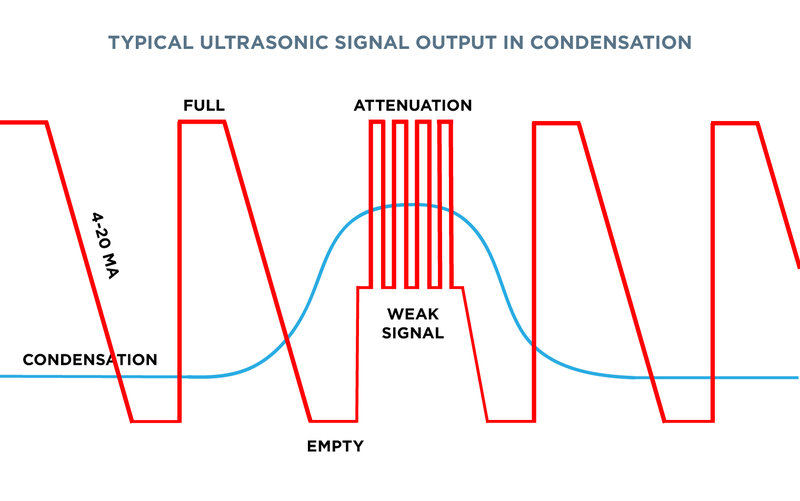 What happens to typical ultrasonic sensors during the condensation cycle? 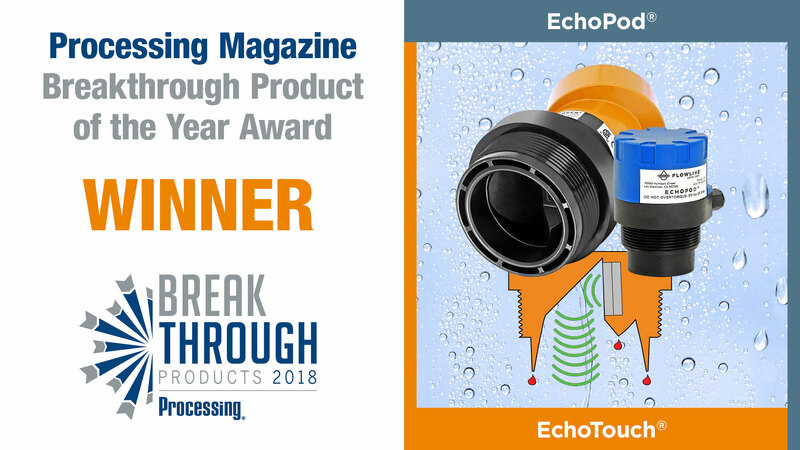 During increased condensation, typical ultrasonic sensor outputs will often bounce between the level and other signal returns, and then re-stabilize when condensation diminishes. 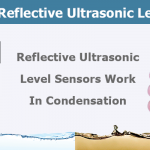 Why doesn’t condensation affect the function of reflective ultrasonic sensors? Unlike horizontal surfaces, substantial droplets can’t adhere to smooth vertical surfaces. 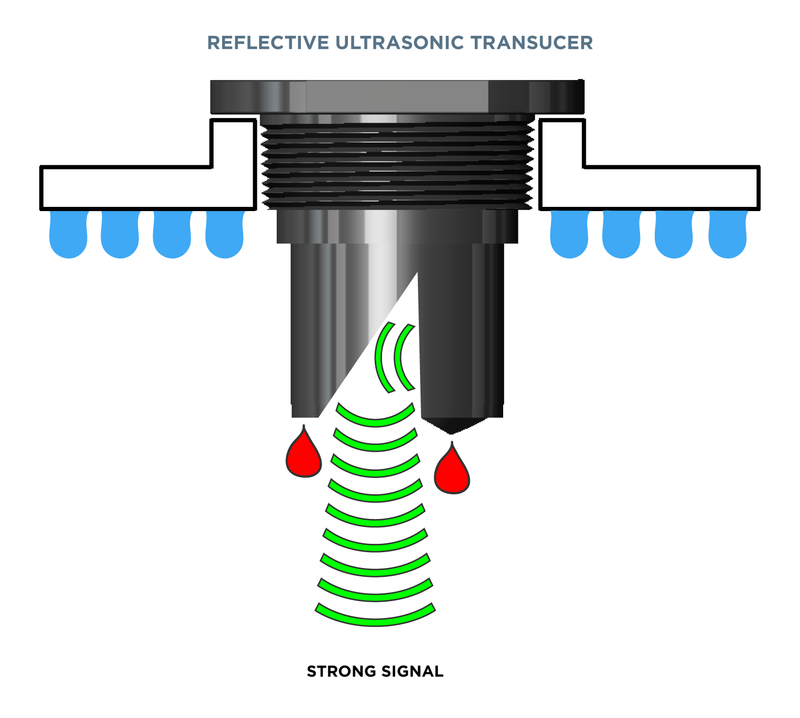 By orienting the transducer vertically, condensation runs off the unimpeded transducer face. Why do reflective ultrasonic sensors provide reliable measurement in condensation? Sensor reliability is determined by the applied strength of its acoustic signal and processing algorithms. Reflective ultrasonic signals remain strong during condensation. What happens to reflective ultrasonic sensors during the condensation cycle? Nothing but continued reliable level measurement. 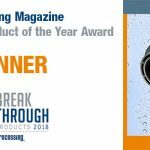 Does Flowline have a reflective ultrasonic level sensor for my application? 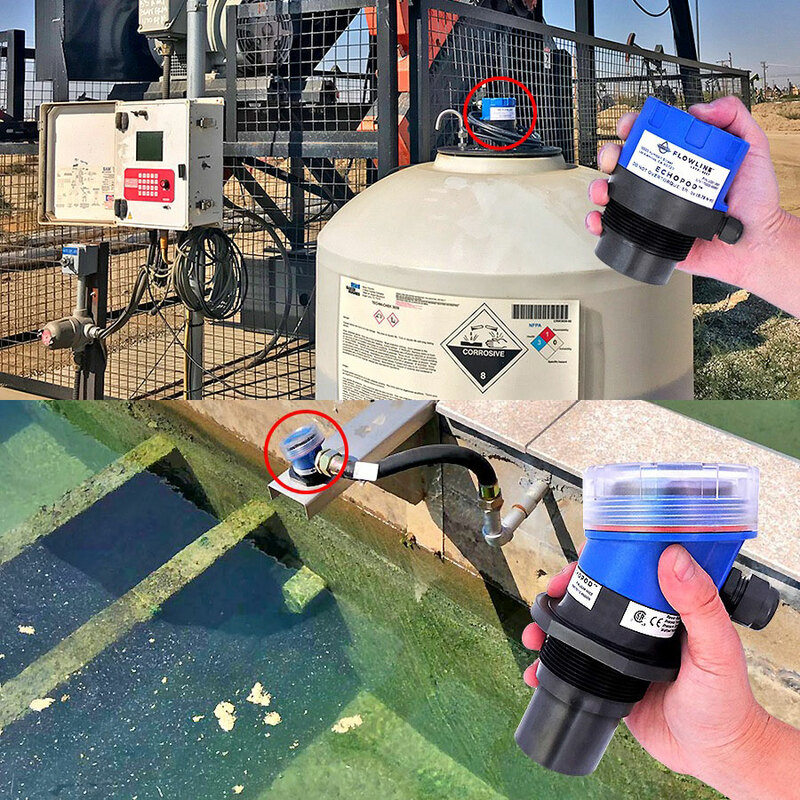 Yes, whether large or small, indoor or outdoor, general purpose or intrinsically safe, we have the best reflective ultrasonic level sensors for your challenging applications.